We also have 5 full service cabins for your friends or family to enjoy a visit with you! Arrived only to find out you will be charged the weekly rate unless you commit to 6 months or longer. Nothing stated about this on their website. That means you can't get the monthly rate quoted on the website unless you are committed to long term. Why not state this important info on the website? Stayed for a week, was there last year and the park was fairly well maintained. This year not so much. Rough gravel pads, poor wifi, bad cable service, no waste containers at dog park, no picnic tables or fire pit. Staff friendly but only saw two people working all week. Pecan Park in San Marcos, Texas is not family friendly and the owners of this park are not respectful to the guests. 1. We camped here in early July and had the campers near us ejected from the park at 11:00 pm because their grandchildren (ages around 6 – 8) were doing sparklers by the river. The guy on the golf cart called the owner and the owner was screaming and yelling at our camping neighbors (paying guests) and called the sheriff’s department. It was a very sad situation for the poor children who left crying and traumatized. As we all watched them pack their campsite we talked with the sheriff department and were advised THIS HAPPENS ON A REGULAR BASIS, but because it is private property they have no choice but to make sure the campers leave. By the way, this was the SECOND time the police had shown up in 2 days. During the time that the “Sparkler” offenders were packing up, there were other campers that began setting off large fireworks down by the river and these campers were not ejected, but simply told not to do that again. When we questioned the “night security” golf cart guy, why they were not ejected we were told it was the owner’s decision on who gets ejected. Go to YELP and look at the "Not Recommended Reviews" at the bottom - they are accurate and also go to www.workampingreviews.com and read what a previous employee has to say about the owners gloating about evicting the guests. 2. There is an abandoned home on the property that is open with no warning signs or security tape and children in the park were running through this home the entire weekend that we were camping in early July. I understand that there was a flood at the end of May, 2015, but the home should have been secured for the protection of the guests. There was also debris lying outside the home and the steps down to the river were very dangerous. 3. The previous year when we camped here we were told to turn off all electronic devices at 10:30 pm and we could only whisper. There is a guy on a golf cart that rides around the park and gets onto all of the guests about this. We even had other campers ask if the golf cart “night security” guy was picking on our campsites. Apparently it is obvious to other campers that there was unfair treatment going on. They do not even tolerate an acoustic guitar being strummed quietly. BUT on July 4, 2014 the park owners showed a movie on the hillside inside the park grounds. The name of the movie was “The Transformers” and this movie was blaring quite loudly until around 11:00 p.m. We questioned the fact that they were even allowed to show this movie in a public venue considering the copy right laws in place. I don’t really understand how they can break their own rules, but paying guests cannot even have an evening of playing games at the campsite that they paid money to reserve. If you want to sleep your vacation away and don’t have children – try it, but if you want to enjoy your family and friends and play games and sing songs and stay up past 10:30 I would pass on this park. 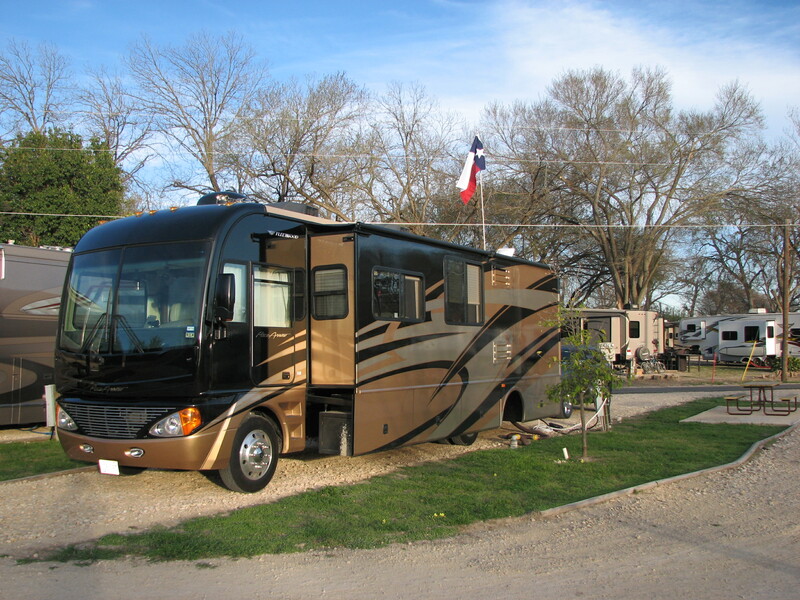 I stayed at Pecan Park Riverside RV three years ago and enjoyed my visit to the area. I stayed at Pecan Park Riverside RV two years ago and again enjoyed my visit to the area. I stayed at Pecan Park Riverside RV this February and will never return. This year the park had new owners. I paid advance for one month and a $50 electric deposit and was placed in the new section which consisted on fill dirt roads and pads on farm land. When it rained it was a muddy mess. After 29 days, a storm was forecast and rather than move in the mud, I left a day early. When I called a few days later to pay the last utility charge, I was told the balance was $560. I was told by the a lady that said she was the owner and that company policy was to enforce the contract that stated that if you leave early for any reason, they will recalculate your rate at the much more expensive weekly and daily rate. By leaving one day early, the site charge went from $300 plus electric to $910. I will not be returning the Pecan Park Riverside RV for any reason. If you reserve a site for over one month and need to leave early for an emergency, you are going to be in for a surprise. The Park has great potential, but need different owners. You can't believe anything anything they( the owners ) say. We stayed two nights here in our Class A towing our Jeep in one of the pull throughs. The park is easy to get to west of I-35 on Hw-80. We had little interaction with the staff or use of the amenities. We had no problems. However, they did not allow discounts during Spring Break, including Good Sam. Stayed for 4 days, and had a wonderful time. Had little interaction with park staff, so can't attest to their welling or lack of courtesy. Access to the river was easy. Park is also easy access to I35. We reserved our camping stay with 2 other RV's aprox 3 months before out Labor Day visit. Once we arrived we were informed that there was no charcoal cooking allowed due to a drought and fire hazard. Funny thing was that that was not the case at other campgrounds, just here. It would have been nice to have been informed that BEFORE we came seeing that we all came with food thawed for cooking outside for aprox 20 of us. When question about this they insisted they emailed us this information but had no proof of such an email and they were not very concerned about this anyway. They did offer at first to RENT us a propane grill but after much conversation with them they loaned us the grill for out stay. Very small grill for 25 people. Also, after setting up, one of the managers walking through the campsites requested that we pick up our outdoor rug we keep just outside our camper (most people do this when rv'ing) every 6 hours so grass can grow. Really? There was absolutely no grass growing anywhere at this park! Very dusty! Many other strange request during our stay and not very friendly staff except for the young lady in the office. Access to the river is very poor. Just one steep path down to the river. The river is not visible from ANY of the sites. Also, very limited tubing if you want to just tube at this location. All in all, we tried this place out because of the high rating it was given on some rv sites but was very disappointed. Won't be returning anytime soon based on the river access and the staffs attitude. We stayed in one of the new sites in March 2011. Liked the park very much, wifi was good, everyone was friendly. Dog park was great. This park has great potential it's a pity that under the current owners it'll not achieve it's potential. A family that is at logger heads with each other does have an effect on the business and on the staff, which in turn effects us the guests. The son manager is a screamer and he screams at everybody, he does not care if you are a paying guest or a staff member. Currently the family is at odds with themselves due to a control/purchase of the park, hope the son and his wife fail in there attempt. The new sites are bare, barren and muddy. The older sites have potential for tree branches that seem in poor shape and could come crashing down on your rig. Bathrooms are in great shape. Cable TV is good, but the Wi-Fi is very spotty in reception. Sites are stone and sand and all seem to need grading even the new sites, although they are wide and long, again they have potential, sadly not the management skills to make it happen.